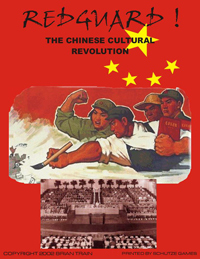 Red Guard is a simulation of the political and ideological conflict termed the Great Proletarian Cultural Revolution that occurred in the People's Republic of China (PRC) from 1966-76. The true sequence of events during this political and social upheaval is difficult to determine, and the numerous books written on the subject do not share a common interpretation. It should be remembered that players are simulating in a very abstract and “gamey” way a tremendously complicated political and social event that was fought over ideological niceties and possession of the trappings of power, and had a great human cost. The cost in human lives is conservatively estimated at close to 500,000, with a far greater number of careers ruined and unjust punishments given. The PRC also forewent almost a decade of industrial and cultural development. The game can be played with 2-6 players. Each human player represents a faction within the Chinese Communist Party, with allied mass support organizations, "Red Guards" (mostly students), government bureaucracies or military units. There are also factions called Non-Player Factions (NPF) that may come under the control of human players during the game. Cheung Kar Fai 7 7 7 The concept of the game is fine but there is some puzzling thing about the start up of the game. Besides the numbers of counter do not fit the game.